We went to Little Rann of Kutch for bird photography. We are doing bird photography in Tundi area and all n sudden I saw one snake. 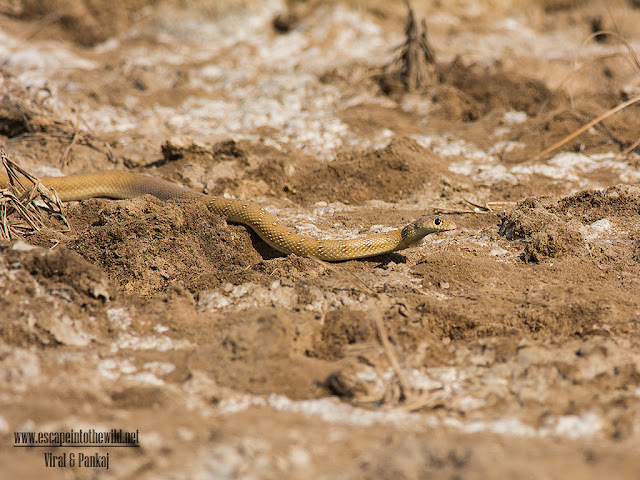 It was first time I saw snake in LRK so I am very excited, it was so camouflage as my friends can’t see them. I tried to make them see many times, but every time they had some difficulty to locate and after a hike they finally saw the snake. It's moving towards the lake to drink water may be. Our guide afraids of snakes and even we also. After coming back to home and uploading to social media, I get to know its name, it is Banded Racer and not venomous snake found in Gujarat.